There is nothing better than these super thick and chewy Caramel Snickerdoodle Cookies. They are perfectly tender and soft and when you bite into them you get to the deliciously gooey caramel center! You can make this fun twist on the classic snickerdoodle recipe for a party, pot luck, neighborhood barbecue, to add to a plate of Christmas cookies, or just for a fun every day treat! These cookies really are over the top delicious and an absolute favorite of our family! Years ago I went on the quest for the perfect chocolate chip cookie. I made probably 100 dozen cookies before I found what I really thought was perfection. And once I had the perfect chocolate chip cookie, I needed the perfect version of ALL of my favorite cookies! Each of these are pretty much equally important, and if you don’t have even just one of them, you might have a good cookie but you don’t have THE BEST SNICKERDOODLE COOKIE. So the quest began, and after about 3 tons of butter and twice as much sugar (I mean I will go ahead and take one for the team here) I ended up with this PERFECT classic Snickerdoodle recipe. Once we had been making them awhile, the kids had the idea to stuff them with caramel. We did it once and never looked back! If you are a caramel lover, you have found heaven! Give these a try and let me know what you think! This is a pretty basic cookie recipe, however, there are a couple tricks I have to share that I think make these cookies extra special. 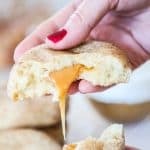 There is also a full printable recipe card for these caramel snickerdoodles at the bottom of this post. 1 cup butter, softened- Make sure that your butter really IS softened! I try to short cut it sometimes, but it is never a good idea! When the butter isn’t softened it won’t combine into the cookies as well, and if the butter doesn’t get completely combined, it can cause the cookies to spread more while baking so you end up with a thin crispy cookie, rather than a nice big, thick, soft cookie. 1 1/2 tsp vanilla extract- Using pure vanilla will give you a much more rich and delicious flavor than imitation vanilla. 2 3/4 cups flour- I will explain more in the next step but you might use a tablespoon more or less than this in the final recipe depending on texture. 1 1/2 tsp cinnamon- If you like your cookies extra cinnamon-y, then you may want to add another 1/2-1 tsp of cinnamon into the mixture. This is really just personal preference, so just add little, by little until you get your desired ratio of cinnamon to sugar. With an electric mixer cream together butter and sugar until light and fluffy. Add in egg and vanilla and mix until combined. Make sure that you get the butter combined well. If you are using a stand mixer, you will usually need to scrape the bottom and sides with a spatula to make sure it all gets really well blended. In a separate bowl combine dry ingredients – flour, baking powder and salt, and mix to combine. Slowly add flour mixture to butter mixture, mixing well between each addition. I like to add about 1/2 of the flour mixture first, then add another half of what is left, then slowly add in the remaining mixture until I get to the right consistency.Having the dough at the right consistency is what will make them bake perfectly how you want them! The dough should not be sticky and should not be crumbly. If it is sticky, continue to add the flower mixture. If it is still sticky at the end of the flour mixture (it shouldn’t be be, but just in case,) mix in flour one tablespoon at a time until it becomes not sticky.If the mixture is crumbly, you have too much flower and the cookies will be dry. Mix in water one teaspoon at a time until the dough holds together. Mix cinnamon and sugar together and place in a shallow bowl. Measure dough with a 1/4 cup measure. Divide the dough in half, placing a caramel in between the layers and then press the edges back together so that there are no cracks. The final shape should be a thick disc. Roll each disc to coat well in the cinnamon sugar mixture and place on a cookie sheet lined with a silpat liner or parchment paper. Bake at 350˚F for 12-15 minutes or until the center is just set. Let cool 2 minutes then cool on a wire rack. Enjoy!This is the other HUGE key in making these perfect! You have to be VERY careful to not over cook the cookies. They will stay light and not brown like some cookies will. When they start to bake you will notice that they are slightly shiny and as they start to bake it will lose the sheen. I like to get it out right as the very center loses it’s sheen. The cookies will continue to bake a bit as they set and this will keep them soft and moist inside for the perfectly chewy cookie. 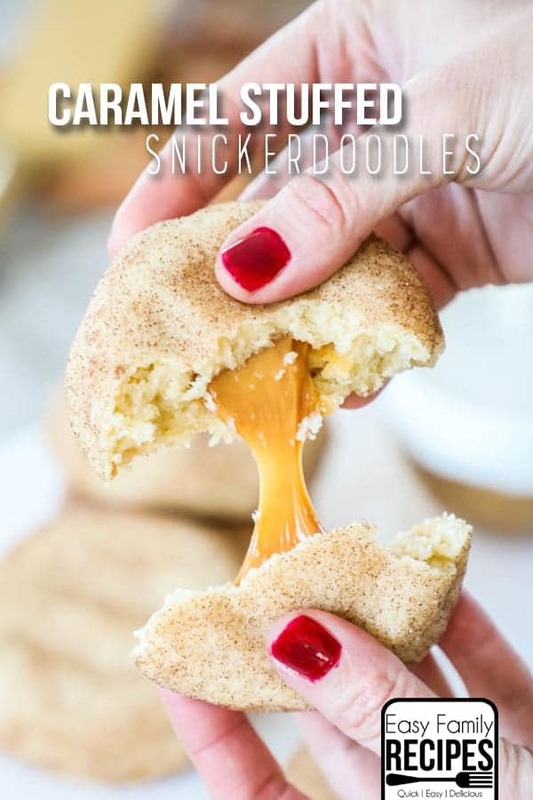 If you love cookies as much as we do, I would love for you to try these Caramel Snickerdoodle Cookies out and let me know what what you think! Especially if you have some little expert taste testers running around like I do! These Caramel Snickerdoodle cookies are over the top delicious! The cookies are tender, soft, thick, and stuffed with soft, sweet caramel candies! They are perfect for a treat for the family or to take to a potluck or barbecue! With an electric mixer cream together butter and sugar until light and fluffy. Add in egg and vanilla and mix until combined. In a separate bowl combine dry ingredients - flour, baking powder and salt, and mix to combine. Slowly add flour mixture to butter mixture, mixing well between each addition. NOTE: The dough should not be sticky and should not be crumbly. If it is sticky, mix in flour one tablespoon at a time until it becomes not sticky. If the mixture is crumbly, mix in water one teaspoon at a time until the dough holds together. Bake at 350˚F for 12-15 minutes or until the center is just set. Let cool 2 minutes then cool on a wire rack. Enjoy! 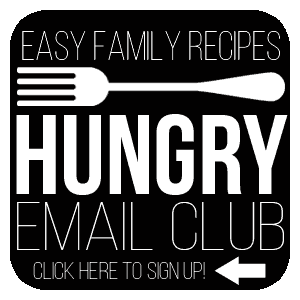 For more great easy dinner and dessert inspiration, sign up for our emails here!